"...And you're back in the room." Illness: over. Much needed break: under (going). Several days into my time off and the last vestiges of illness, along with the stresses of work are melting away. Which is just as well, as there's plenty to do. But let's get things back on track. 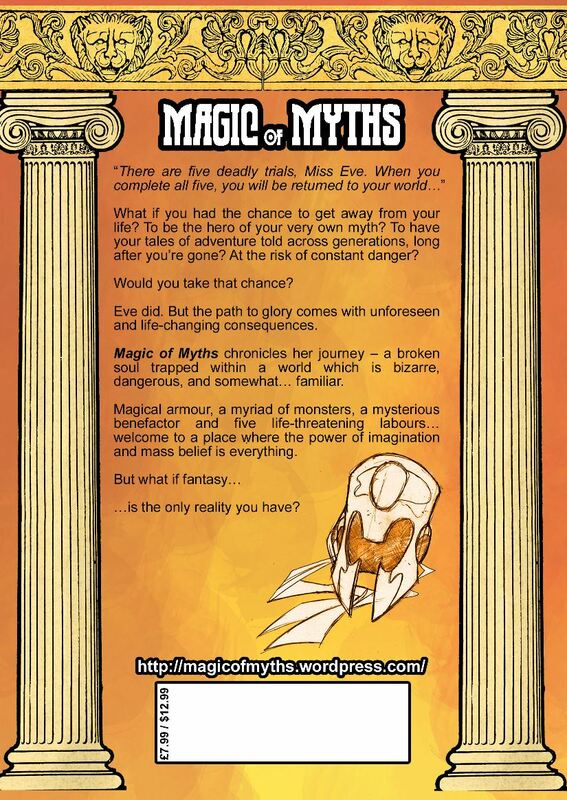 Mine and Sergio's forthcoming miniseries graphic novel, Magic of Myths: season one, is on the verge of release now, with a May 14th 2011 launch. At a wallet friendly price of £7.99, we'll be launching the book the Bristol Comic and Small Press Expo, selling it on the show floor for Saturday only. The very kind and talented Simon Gurr has offered to share his table for the launch of Magic of Myths: season one, so you can come over on the day and buy a copy from Table 16 in Hall 3 (here’s a map for you: http://www.thefallenangel.co.uk/spexpo/BICSPE%20layout%202011.jpg) as well as buy some fabulous artwork from another amazing artist, Jennie Gyllblad (who is working with me on our graphic novel, Butterflies and Moths). We'll also be selling Magic of Myths: season one at the wonderful comic book shop Nostalgia and Comics, online vendors, and a couple other places as well. Hopefully a few digital options will be available by that time, too. What is Magic of Myths? Well, it's a fantasy adventure following a young lady called Eve as she's plunged into a bizarre magic world and forced to complete five tasks to return home. Check out the back of book blurb below and you can read half of the story (issues one to three) for free over at the official site. More news to come on this and another project in process, soon.